← Tiramesu Italian Restaurant / Great wine list! McLaren Vale, Australia husband and wife winemaking team. Sarah and Sparky Marquis. The wine label has their son Luke on the label. How cute is he? They have received more 94-99 point scores from Robert Parker than other winemaker in the world. They have also had five 99 point scores in the last ten years. Quality and consistency with these fabulous wines. Now for the coolest part that goes against everything we have been told. Let’s do the SHAKE!! They add nitrogen gas in each bottle to protect their wines. The shake releases the nitrogen gas and the flavor profiles pops out to its full size. Using nitrogen means less sulphites and some people have fewer reactions. First pour out half a glass, put the cap (screw top) back on and shake vigorously, open and you will see bubbles at the top of the bottle. By opening you let out the nitrogen, then you put the cap back on shake again then serve. What fun, and talk about a great conversation piece. As we poured into our stems, the aroma was intoxicating. This was a huge fruit bomb , mid palate had ripe sweet fruit such as plums, blueberries, full body Shiraz. Chewy tannins, high acidity, which means it pairs well with many beef dishes and sharper cheese. The funny thing was how inky this wine was. As we sat at my dining room table after dinner finishing up this great bottle, my friend was talking to me and her lips and teeth were colored a dark purple. Her teeth were coated, ha ha I did not realize my lips and teeth were the same until I went to brush my teeth before bed. We really enjoyed this great bottle with churrasco steak. My only comment is if you order this at a restaurant take crest whitestrips, you may need them. This entry was posted in Australia, Shiraz and tagged Australia wines, Blue eyed Boy, chewy, McLaren Vale, Mollydooker shake, Robert Parker, Shiraz. Bookmark the permalink. I want to try the inky wine. So the nitro doesn’t carbonate it at all? Thanks so much for the great write-up! 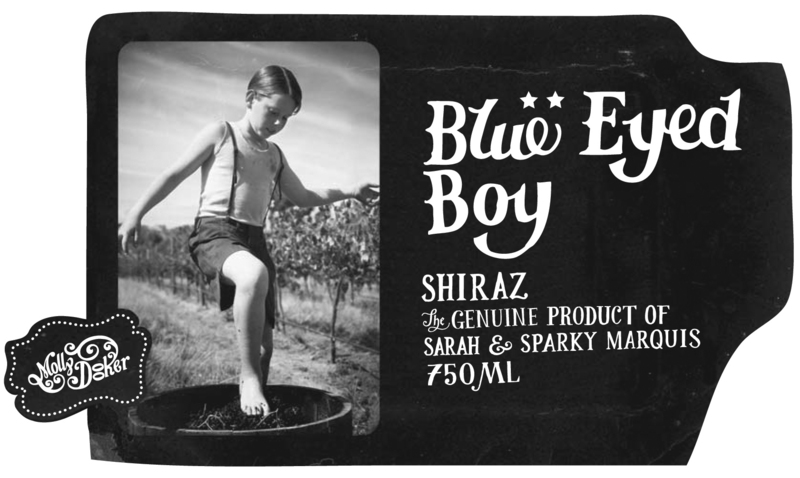 The Blue Eyed Boy is my all time favorite wine, so it’s nice to see others enjoying it as well. You are right though, it definitely leaves you with purple teeth! We liked your comments so much that we’d like to put them up on our website, but we need your approval first. Would that be alright? Thanks again and stay in touch! Hello, thank you so very much. Loved this wine as well as so many others from MollyDooker. I’ve already put a link to it on our Facebook and will definitely include it on the website! Thank you I am honored. Cheers! You won’t need to sell Tracy and I on this wine. Sarah and Sparky have made many wines over the years for wineries like Shirvignton, Henrys Drive, Marquis Philips, etc that we have enjoyed. My collection contains the Shirvignton and Velvet Glove that have an RP-99 rating. Great article on my favorite winery/vintners. Thanks so much for reading. 🙂 Yes, I have had many of their wines as well and love them. Thanbk you for telling me about Shirvington and Velvet Glove, have not had either. Cheers!